Well-planned public spaces help promote physical and mental well-being. Three Bridges Park. Photo from the City of Milwaukee. Making healthy choices easy is a public-health goal. And how communities are designed can actually have a dramatic impact on that goal. Better still, any civic-minded group or individual can initiate community-health-oriented projects, from developing a new trail or park to reprogramming existing facilities. Until the 1930s, it was understood that most people would walk to local destinations, and streets were planned accordingly. But with the rise of the automobile, planning models changed, especially in the U.S. Instead of creating communities within a few minutes walk, it was assumed everyone would drive. Blocks became very large, intersections were spaced to reduce traffic stops and essential places such as grocery stores were located where they required long travel routes. That’s why the Center for Disease Control and Prevention (CDC) and its National Center for Environmental Health established the Healthy Community Design Initiative and hired Dee Merriam in 2008 as a community planner. Merriam, a landscape architect, was charged with helping identify planning policies that might lead to healthier communities. Merriam, who recently retired from the CDC and no longer speaks for the agency, had previously served as a park system planner for the DeKalb County Parks and Recreation Department in the Atlanta area. She was a keynote speaker at the recent annual conference of the Wisconsin Chapter of the American Society of Landscape Architects (ASLA), held at UW-Madison. I spoke with Merriam about the practical approaches she espouses. A gracious advocate for big-picture thinking, she stressed the importance of structuring collaboration into community planning, design and development processes. She said that although most government regulations are founded on “providing for the public health and welfare,” it’s actually “rare for public health and community development officials to collaborate.” She encourages professionals with diverse titles to “get out of their silos.” Operating in isolation often wastes tax dollars on duplicative systems instead of leveraging opportunities to serve broad public goals, she stressed. Sewer lines typically follow streams and are great locations for trails. It is far easier and cheaper to negotiate public-access easements with developers–which can eventually become trails–than to later negotiate with hundreds of individual property owners. Detention ponds can be designed as attractive neighborhood amenities and play spaces instead of fenced-off mud holes. This can transform something that is too often a negative feature into a community asset. However, there are few incentives for developers and water management officials to do so. Canopy street trees reduce storm-water runoff, improve plant-growing microclimates and enhance neighborhoods. Nonetheless, street-design guidelines rarely provide adequate space for them. To reduce silo-based approaches, Merriam defines “green infrastructure” to include parks, sidewalks, trails, air quality, community resilience and water management. Successful public green infrastructure involves not just what is seen and felt — say, in a lovely setting with beautiful views and comfortable benches. Other factors, such as street patterns, block size, and residents’ proximity to public spaces, can also support positive health outcomes. Merriam believes citizens are better served when public health is a stated goal of any project, not just a nice byproduct. To that end, while at CDC she-co-authored several downloadable publications. They can serve urban planners, parks and recreation professionals, and health practitioners, as well as civic groups and individuals wanting to foster healthier neighborhoods. One such guide is the Parks, Trails and Health Workbook. Another is Improving Public Health through Public Parks and Trails: Eight Common Measures. Start with a “community health profile” for a neighborhood or entire municipality. Work with the local health department to identify specific issues affecting a community. Health departments often have reports that highlight their concerns for targeted geographic areas and demographic groups. Other resources can be found using the Health Data appendix in Merriam’s workbook. Such data could also help enlist support for a project. Identify potential partners. That could include schools; agencies serving youth, seniors, veterans and those with disabilities; faith-based organizations; community-garden and farmers’-market advocates; businesses with park or health interests; walking and bicycling groups; adjacent property owners and neighborhood associations; local parks, planning, development and public-works departments; all types of health-care providers; social-service agencies; nonprofit organizations; university public health and nursing/medical programs; university planning, architecture and landscape architecture programs; health insurance companies; law enforcement agencies and emergency medical services. Leverage park and trail creation with other development initiatives. Merriam stresses that “holistic” long-term planning can work to everyone’s advantage, including developers. Both in new and existing communities, public projects can be planned to simultaneously address wide-ranging green infrastructure, including parks, trails, streets, canopy trees, sewers, and retention basins. Developer-impact fees can be an efficient — and cost-effective — means to accomplish diverse goals. Strive for equity within outdoor recreational resources. Merriam encourages designing for equity across age, race, gender, income, ability levels and at-risk populations. One strategy for serving diverse populations is to consider the needs of two-year-olds and 80-year-olds. Another is to solicit input from those who could benefit from a park, trail or program. The parks-and-trails workbook includes a model matrix for how a space can serve targeted demographic groups during different seasons, days and times of the day. Ensure pedestrian access to parks and trails. Parks are both walking destinations and venues for fun that can promote physical exercise with access to parks and trails and walking/biking routes. 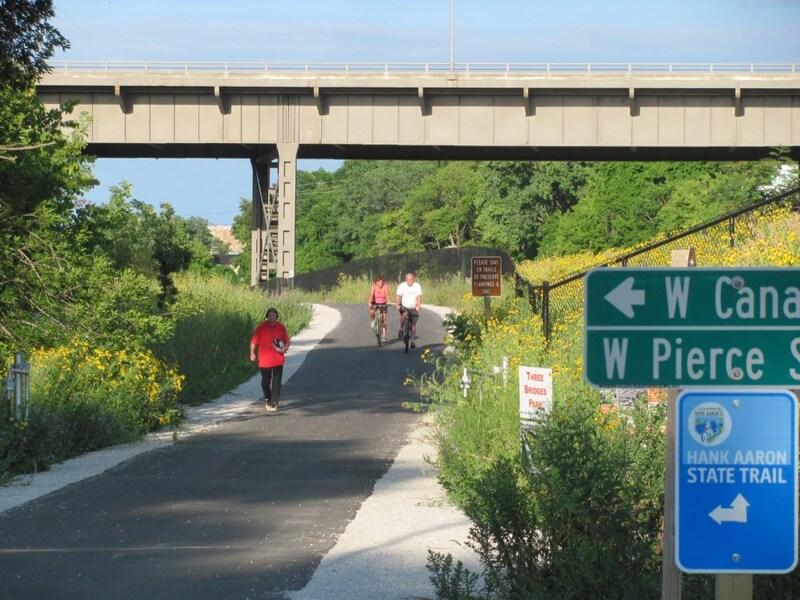 Improving Public Health through Public Parks and Trails provides guidance on how communities can quantify and track pedestrian access to parks. One benchmark goal is to increase the percentage of people within a half-mile walking route to a park. Merriam notes this should mean routes to entrances accessible by foot, not just “as-the-crow-flies” distances. Park access can be improved by adding park entrances, creating adjacent pedestrian-friendly streets or providing new connections to them. Create conditions for people to feel safe. That’s essential to “ensure maximum and appropriate use of parks and trails,” the workbook stresses. Ways to achieve this include: evaluating the condition and use of existing features such as exercise equipment, picnic tables and amphitheaters; determining visibility from various vantage points, especially from adjacent property, streets and key points within a park; evaluating park and trail signage; plotting locations of existing light fixtures and quality of lighting along access routes, entry points, and areas designed for use during non-daylight hours. A safety assessment can also identify nearby land uses or businesses that might affect park safety or security, as well as vacant or poorly maintained properties. Reviewing crime rates and hot spots within an area, as well as pedestrian and bicycle crashes, can round out a safety profile. Reduce the length of blocks. Merriam points to studies showing that short blocks (300 feet or less) encourage walking and increased sociability, which can also foster health. Set aside land for future parks and greenways. “Aspirational planning” has always been crucial in successful park systems. Merriam notes that natural-resource inventories are improving in their comprehensiveness and can be effective tools for long-range decision-making. She recommends mapping sites with inherent community value, such as flood plains, steep slopes, viewing points, important habitats and cultural sites. Establishing an initial 200-foot buffer around these resources can protect them and provide space for supportive development such as trails. An overlay zone extending beyond an aspirational planning area allows planners to discuss incentives with developers — early on — that help protect community resources and desirable street patterns. All great advice from a veteran in the field, you might say. A couple of additional thoughts to supplement Virginia Small’s excellent piece. First, in our country, new ideas tend to go from west to east. Here is an example: In the East, especially at the community level, there are ongoing discussions about “health care,” often with a focus on hospitals, but also on primary care. On the West Coast, these discussions are now much more often about “healthy communities,” based on the belief that we will never have the money to provide adequate health care for an increasingly unhealthy population. All of the design concepts, especially those related to activity across all age groups,, that Virginia spells out in her column are central to building healthy communities. Second, fundamental changes in nutrition have to go with those community design actions if we are to achieve healthy communities. It’s really fairly simple: you cannot out-walk/outrun a cookie or other sugar-laden foods and drinks. The numbers just don’t add up. In certain communities, we have to de-normalize the notion that diabetes and related illnesses are more or less inevitable facts of life. Finally, the headings in Virginia’s column make a perfect checklist for planning community change. There is a large plot of land near us in Brown Deer that could be made into a dog park. It is along Southbranch Creek, between 48th and 51st streets and along Churchill Ln. There was a flood in August of 1998 and 10 homes along Churchill were severely flooded. The Village of Brown Deer received Hazard Mitigation Grant to purchase and demolish these homes and develop a 4 acre dentention area. It is dry most of the time. When I was a kid many years ago we would have made our own baseball and football fields there. It should be used now and not just be a place for the geese.